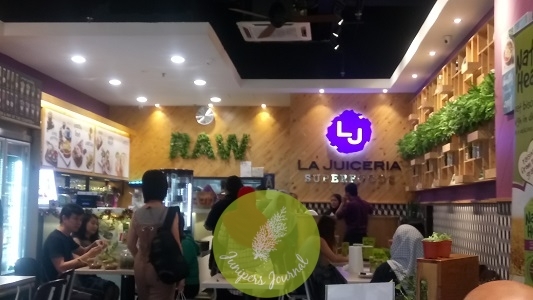 Today’s Guardian Malaysia Nature’s Heart event was held at La Juiceria Superfoods Verve® Shops Mont Kiara and after the food terrarium session, we were treated to a very healthy lunch at the café. La Juiceria Superfoods is well known for its fresh and nutritious juices but I have to say their food is just as good as their juices. 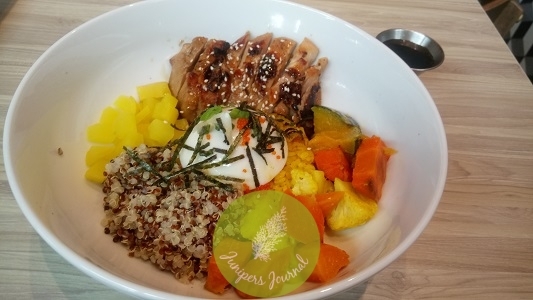 I had the Teriyaki Chicken Grain Bowl and it contains grilled teriyaki chicken thigh, Japanese turmeric pearl rice, quinoa, takuan pickle radish, poached kampong egg, roasted seasonal veggies, tobiko fish roe, togarashi chilli sprinkle, kizami nori shredded seaweed, spring onion and teriyaki sauce (on the side). It’s a beautifully presented dish with cheerful colours and looks appetising. The best part of this dish is the quinoa as it really does taste a lot nicer than white rice. If only my budget will allow me to eat quinoa every day. The sauce is not too salty and I like the fact that it’s in a separate small container so you can pour in as much as you like.